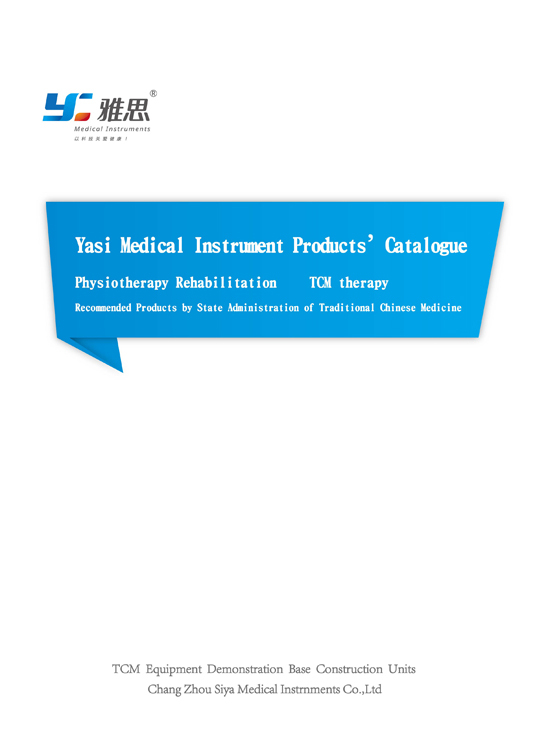 Changzhou Siya Medical Instruments Co., Ltd (Old name “Changzhou Yasi Medical Instruments Co., Ltd” ) created the brand “Yasi” in year 2004, and is a high-tech company devoting to develop, produce and sell the physiotherapy, rehabilitation and traditional Chinese medical apparatus. The company has put great importance in importing high-quality R&D talents including a number of doctors and masters, and the engineering and technical members has made up 70% of total company staff. According to the standards of GB/T19001-2008 idt ISO9001: 2008 and YY/T 0287-2003 idt ISO 13485: 2003, the company has set up the quality management system covering from market research, product R&D, manufacturing to after-sale service, and has been officially approved by the SATCM for the first batch of "Chinese medicine treatment equipment production demonstration base construction units". The company is aimed to win the leadership of domestic physiotherapy, rehabilitation and traditional Chinese medical apparatus producers. Currently, the “Yasi” Brand’s main on-line products, including 10 series of over 104 models have all got the registration certificates issued by China’s Food and Drug Administration, and 8 series of 82 models of them have been officially recommended by the China’s Food and Drug Administration. The company’s products all have got the proprietary intellectual property rights, and 33 patents, including 2 invention patents; 10 “software copyright”certificate and 10 “software product” certificate. “Novel Technology Makes Healthy Life”. Yasi company will adhere to the road of industrialization of the scientific and technological achievements, pay attention to hospitals’ and patients’ feedback, continue to develop high technical, good quality and effect medical apparatus, and every nuance will show our enthusiasm, sincere and responsibility. Hope to share the joy of success with you!